The tiny island of Iona lies off the south west coast of the Isle of Mull, on Scotland's west coast. Iona itself is only 3.5miles long by approxmately 1.5 miles at its widest point, and on a clear day the views and scenery are stunning, as we hope you can see from some of the pictures on this site. Staffa, where the legendary Fingal's Cave is located, is a tiny island 6m to the north of Iona, and along with many other small islands form Scotland's Inner Hebrides region. 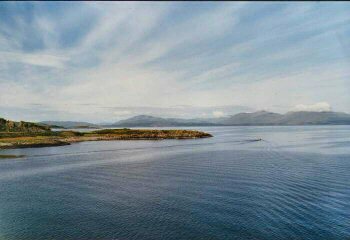 Access to Iona is via the Scottish mainland coastal town of Oban, where a ferry can be taken to Craignure on the Isle of Mull. Then either by car of bus one can travel accross Mull to the south west tip, where a small ferry crosses the Sound of Iona, from Fionphort on Mull to the Island itself. Cars are not permitted on the Iona. 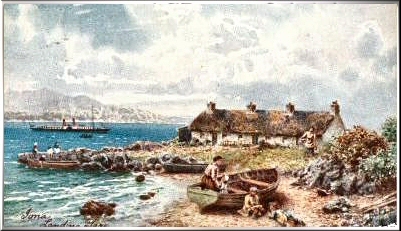 Tuck's colour postcard from c.1910 showing the landing stage on Iona, with large paddle-steamer anchored in the Sound of Iona, and small passenger boat heading towards the island. If you check on the link here, you can see exactly where Iona is located, and its relationship to the Isle of Mull, and the Scottish mainland. During the early 20th century the Ritchies would have travelled on a large paddle-steamer run by the firm Caledonian MacBrayne, which sailed regularly from Oban to Mull and Iona, as well as alowing passengers to visit other islands, weather permitting. Smaller boats were lowered from the steamer in order to land passengers on these islands.